Like many others on Lumber Jocks, I also own a powerful HFT 2hp #97869 dust collector. 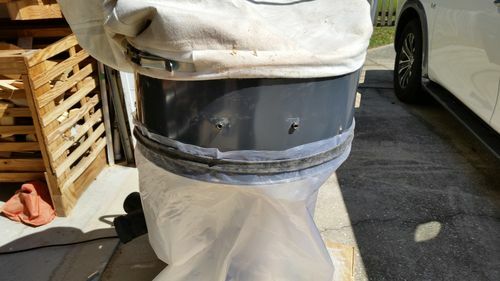 Unfortunately, two of the collector support tubes on my system broke the other day so I took this as an opportunity to fix everything I didn’t like about this dust collector. It is very difficult to change the bags on these things. I absolutely dread it. I have fiddled with using tape and clamps to help secure the bag and strap, but it is still frustrating and time consuming. The little bag clips attached to cyclone are worthless. Furthermore, the collector support tubes get in the way. The the three collector support tubes are flimsy and weak. Two of mine broke where they attach at the base. There is nothing sturdy about the setup. The platform is awful. The wheels are so small it barely rolls over sawdust. 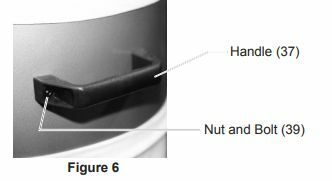 The only way to move the dust collector is to grab the handle that is attached to the cyclone. But if you pull or lift on the handle, you will eventually break the collector support base. Its a Catch-22 type of thing. I don’t even know why they added a handle in the first place. Lastly, there is no support for heavy bags. Half of the bag hangs over the end of the platform and the weight of the contents puts a lot of stress on the supports and the bag itself. I used to put blocks under the bag to relieve some of the weight. There is also no way to adjust the height so you can use different size bags. 1. Like others have recommended, I replaced the base with a 24”x36” HFT Platform Truck #68894. 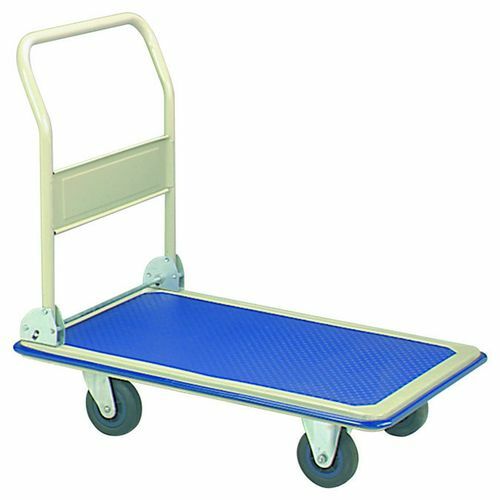 The platform is nice because it has large wheels and a nice big handle to drive it. I also removed the useless small handle on the cyclone because it was no longer needed. 2. 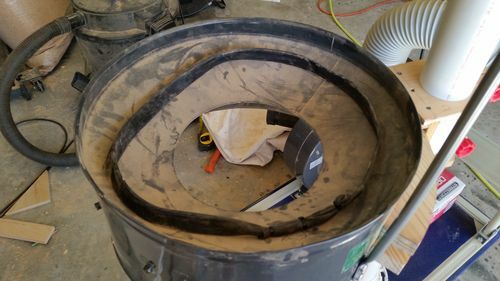 To help secure the bag to the cyclone and free up my hands, I cut a 27” x 1-1/4 bicycle inner tube down to about a 12”-15” diameter and placed it around the bottom rim of the cyclone. I connected the ends together using three zip ties. I cut, trimmed and sanded any sharp edges on the zip ties. I use inner tubes like this on all my yard trash bins too. 3. I eliminated the three flimsy collector support tubes. 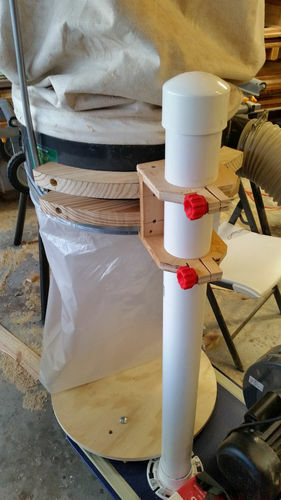 I replaced the support tubes with a single 3” X 44” piece of PVC tubing to use as the support column. I glued the PVC to a 3” flange and bolted it to the platform. The flange and pipe are mounted off center to allow for space and alignment considerations. I placed a 3” cap on the PVC but did not glue it down. The PVC tubing provides a very rigid column which doesn’t flex. While the PVC doesn’t flex, the platform it is bolted to may flex a little, but just barely. If a little flexing bothers you, you can always add plywood support under the platform. 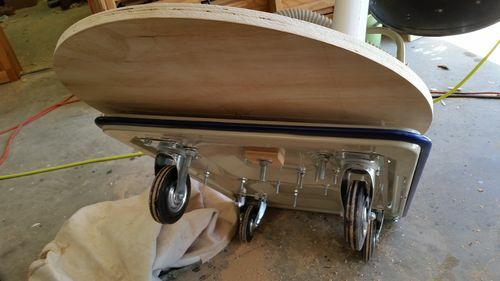 I cut out two semi-circle braces from 1-1/4” pine and bolted them to the cyclone mid section making sure I left room at the top and bottom for the bag straps and the inner tube. I then built a small pipe clamp assembly to attach to the braces. The clamp assembly fits over the 3” pipe. I use two knobs to adjust the tension. The brace and pipe clamp assembly allows for height and orientation adjustments and can accommodate a wide variety of collection bags. With the three cheap supports removed and a single, large PVC column installed, the collection bag and strap are much easier to attach because the entire cyclone area is exposed without an obstruction. There is now a three inch clearance between the PVC pipe and the rim of the cyclone. I also designed a 3” pipe clamp that can be printed with a 3D printer if you have one. It should be printed as a solid with no infill. With my current 3D printer setup it would take almost two days to print so I am waiting for some larger nozzles to arrive before I attempt to print. I designed it on FreeCAD. If you want a copy I can send you the project and/or an .stl file that is ready for printing. 4. 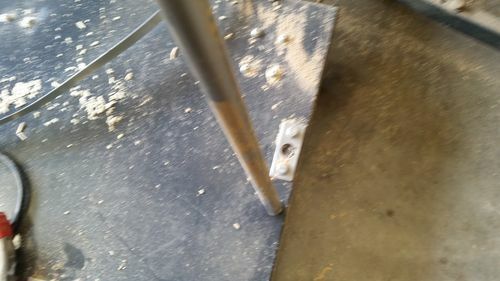 Finally, at the end of the platform I bolted a large 24” piece of plywood to fully support a heavy bag of sawdust. I cut the circle on my table saw which was a first for me and it worked well. Unfortunately I had to redrill two of the mounting holes because I forgot to take the radius of the front spinning caster positions into account. Overall I am very happy with the modifications. Had I done this long ago and I would have saved myself a lot of hassles. Unlike others, I did not add a Wynn 35A cartridge filter because I always run my dust collector outside. I hope this is helpful to those of you considering making modifications to your DC systems. I believe the HFT #97869 is a generic Chinese design sold by many other vendors so these modifications should work on those models too. Yoau did a great job. Nice to make something good better. Thanks, overall its a nice, powerful little dust collector. Definitely worth repairing. It’s nicely done and will be a fine addition to your shop. In my case I just roll the portable dust collector outside so I don’t need a wynn filter. I once had a dust collector in a small basement workshop with a good 3rd party filter installed and still had a significant dust problem. I even tried putting it into a closet and installing an air filtration unit on the ceiling and it was still awful. After that experience I don’t think I will ever run a dust collector inside a small workshop again no matter how good the filtration system is. I would rather punch a hole in the wall and connect to the DC outside before I try that again. I am sure others with larger shops have a different experience. In my case I just roll the portable dust collector outside so I don t need a wynn filter.